Tomorrow I depart for La Selva and my jungle adventure. Nineteen (19) days in heaven. Don't you think the Garden of Eden was a rainforest? That's how I picture it. Although I think the weather was probably more temperate, not quite as hot as La Selva will be. Like San Jose, the temperatures change little year round, being in the Caribbean foothills of Costa Rica, they range between 66 degrees at night to 88 degrees during the day. The humidity on the Caribbean side of the country is what makes it feel hot. La Selva has an average annual rainfall of 13 feet. The rainiest months are July, November and December, so I am glad I'll be there in February. Although it generally rains every day, the mornings will be sunny with light rains during the afternoon. 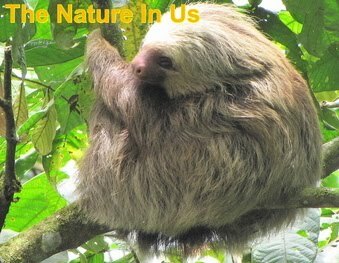 Founded in 1963, La Selva is one of the first private protected areas in Costa Rica. La Selva Biological Station is located in the Caribbean foothills of Costa Rica and comprises 1,614 hectares (3,988 acres) of old growth and disturbed tropical wet forest. Species diversity is spectacular, including more than 1,850 species of plants, 350 species of trees, 503 species of birds (there are 886 in the country), and approximately 500 species of ants. La Selva is connected to an altitudinal transect that climbs from 35 meters above sea level at La Selva to 2,906 meters at the summit of Barva Volcano in 22 miles (35 kilometers). Together with Braulio Carrillo, Irazú and Poás Volcano National Parks, La Selva is recognized as part of a UNESCO Biosphere Reserve. It is home to 5 of the 6 species of big cats (jaguar, ocelot, puma, jaguarundi, and margay) of Costa Rica and has more than 60 species of bats. Knowledgeable bilingual naturalists' lead daily nature walks to explore life this magical rainforest of well maintained trails. At least I'll be able to see what's ahead of me on the path to avoid the 49 species of snakes they have here. The elevation is 115 feet above sea level so the paths are pretty level which is absolutely perfect for me. 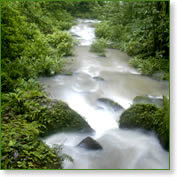 La Selva Biological Station is situated at the confluence of the Sarapiquí and Puerto Viejo rivers. Its extensive trail system travels through varied habitats such as old-growth rainforest, regenerating agricultural lands that were once cleared for farming, and a growing arboretum with plans for every species of tree in La Selva to be included in it. Currently there are 254 species present in this area. Temperate forests in Europe or North America consist of only several tree species. The norm in tropical forests is to find between 50 and 100 tree species (or more) within the area of a few acres. 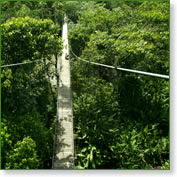 La Selva offers a unique combination of pristine ecology and expert naturalist guides for bird and natural history walks. All day workshops can be scheduled such as Bird Watching 101. They've got the educational resources to provide whatever your needs are. Early morning bird walks and night walks provides numbers of species beyond what you can imagine. Accommodations are comfortable and clean, but not fancy. Very natural also since the rooms have screened windows - glass isn't needed since the temperatures are moderate and even on warmer days the fans provide comfortable cool. No windows is one of my favorite things! You can hear the sounds of the birds and the howler monkeys morning and night. The fresh air does the body a load of good and definitely keeps the mind alert. 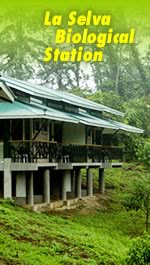 This biological station has been a pioneer in education, research, conservation and eco-tourism in Costa Rica since 1953. La Selva is recognized as one of the world’s leading centers for research, education, and natural resource management in the tropics. It offers 54,000 sq. ft. (5,000 square meters) of facilities for science and education including: room and board for 134 persons, a dining hall for 110, classrooms, wireless internet, library, herbarium with plant specimens, and a anthropod building with thousands of arthropod species being currently recorded. An extensive trail system of 38 miles (60 kilometers), of which 8 miles (12 kilometers) are paved, provide unique access to diverse tropical lowland ecosystem. Major research projects focus on forest dynamics, biodiversity, plant and animal systematics, nutrient cycling, carbon sequestration, and native species reforestation. Research at La Selva has led to publication of more than 2,600 scientific articles, theses, and books. Each year more than 350 scientists and thousands of international students come from 25 countries to La Selva to study tropical ecology. Research here has led to almost 2700 scientific articles, theses and books. La Selva began when a tropical forester named Dr. Leslie Holdrige acquired the core property in 1953. His goal was to implement his ideas about the sustainable, nondestructive use of tropical wet forest since it was being destroyed for farm land. The area was already the site of important work, by his students and fellow scientists, on tropical forest and birds. In 1968 it was purchased by the Organization for Tropical Studies (OTS) and declared a private biological reserve and station. International recognition of the value of this conservation area came in 1988 when UNESCO recognized Braulio Carrillo National Park together with La Selva and Irazú Volcano and Poas Volcano National Parks as UNESCO Biosphere Reserve, intended to integrate conservation and sustainable management of natural resources. With the Organization for Tropical Studies, management access is easy. New buildings have been constructed and the reserve is now three times the size it was. My favorite program to be involved in even when I'm not here is the Adopt-a-Trail Program. Please join me in keeping La Selva here for future generations. Sponsor a piece of salvation for the planet through La Selva's Adopt-a-Trail Program.